Microkeeper maintains a full list of public holidays for all states in Australia. You can see this list by visiting the List of Australian public holidays page. 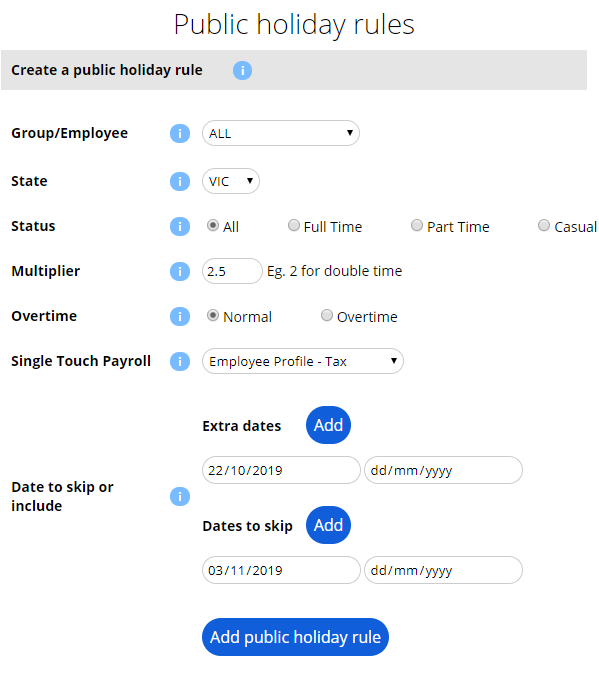 At the top of the payslip page is a form that will display all public holidays that were present during the pay period. 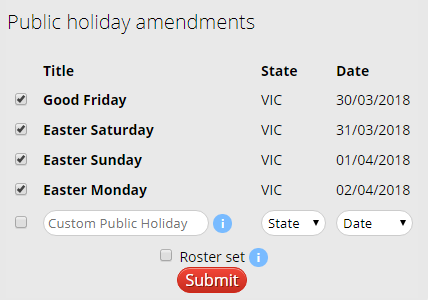 There is also the option of adding a custom public holiday for any date or state desired. Full time - A full time employee clocks 30.4 hours, they did not work on a public holiday, when a public holiday amendment is submitted, a 7.6 hour public holiday payment will be added to that employees pay for a total of 38 hours. Salary - A salary member of staff is set on a fixed 38 hour week, they did not work on the public holiday, when a public holiday amendment is submitted, the 38 hour payment will become 30.4 hours and a public holiday payment of 7.6 hours will be added. This will have no effect on the employee earning but will be recorded accurately. Auto overtime - An employee clocks 35 hours, they did not work on the public holiday, they are set to automatically get overtime if they exceed 38 hours, when a public holiday amendment is submitted, a 7.6 hour public holiday payment will be added, the employee will now have 42.6 (35+7.6) hours total. This will be broken up into 30.4 hours of basic hours, 7.6 hours of public holiday and 4.6 hours of overtime. Time in lieu - An employee clocks 35 hours, they did not work on the public holiday, time in lieu is set to balance with 38 hours, when a public holiday amendment is submitted, a 7.6 hour public holiday payment will be added, the employee will now have 42.6 (35+7.6) hours total. This will be broken up into 30.4 hours of basic hours, 7.6 hours of public holiday. The employee will get paid for 38 hours and accumulate 4.6 hours time in lieu. Part time - A part time employee has fixed hours on Tuesday, Wednesday and Thursday. On all other days the employee has been marked as unavailable in the employees profile. A public holiday falls on a Monday. The employee does not typically work on a Monday, when a public holiday amendment is submitted no public holiday payment will be added. Before an employee can be paid for working a public holiday we need to create a Public Holiday Rule that will comply with the award for your industry. The rules you create here will be applied to shifts worked on dates listed in Microkeepers List of Public Holidays. Select the Group or Individual Employee the Rule and status the rule applies to. You then have a choice to add or skip dates. For example; in Geelong, the Geelong Cup is celebrated as a Public Holiday instead of Melbourne Cup. Add extra date 22/10/2019 and add skip date 03/11/2019. Any dates added or missed will need to be amended each year. Click add public holiday rule.